Open your Player Settings and add ICE_INVECTOR_TPC to the Scripting Define Symbols. Sorry Pit but I'm just not getting it. Does this handle all damage from Invectors Shooter Template as well? I tried your steps but my creature will not take damage from any attacks, melee or ranged. Hi Jacob, normally the damage handling should work also with the "Third Person Controller - Shooter Template". However, I have developed the integration by using the "Third Person Controller - Melee Combat Template" but I don't believe that Invector is using different damage handler for their projects. I have purchased now the upgrade for the "Shooter Template" and will test it as soon as I'm finish with the general update - hope this is okay for you so far! Thanks man you are awesome! Loving the asset so far, I think its more my inexperience with it more than anything but I really admire the philosophy behind it. I'm not sure where I went wrong but this is what I have got working so far with Invectors Shooter Template. Using their VObjectDamage script on triggers attached to the creatures claws to damage the player ( not ideal but works ). Using ICECreatureProjectile on their bullet prefab (vDefaultBullet) to pass damage to the creature. 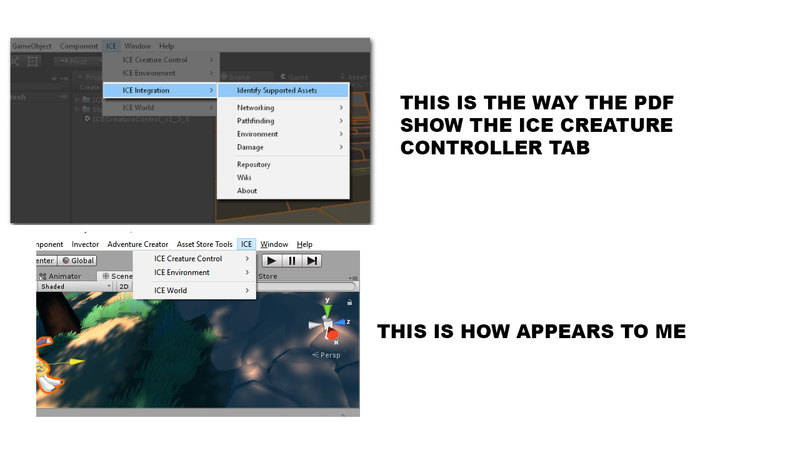 To install ICEIntergration package: Import it the default way or by double clicking it at Unity/(Your Project Folder)/Assets/ICE/ICEIntergration.unitypackage. That's its new location since version 1.4 release. It was not installed by default like previous versions. Tried the above instructions. I get two errors. I did what the info in the errors suggested, but the same errors occur after. I'm newish to coding, so it's probably something simple. Could anyone help? I'm using Invector shooter package and latest Ice. "You can open your Player Settings to see which Assets was detected. All ICE based defines will starting with ‘ICE’. Something like "ICE_INVECTOR_TPC" should appear within your defines. Feel free to remove all needless defines as desired, this will avoid overhead by deactivating the unneeded code sections. Basically the both above-mentioned steps will handle the complete integration process, so there is nothing else to do besides of the typical component settings. However, ICE can handle such required code modification for you. In cases an adapter requires code changes you will find one or more additional menu items within the Integration menu structure, just press the corresponding ‘Adapt Script’ item and ICE will doing the rest." For a deeper understanding of the ICE integration process, review page 85 ~ onward in the manual. I believe you're right, another clue is I recall Pit stating this on the Unity forum: "Hello, it seems that you get these errors because your project contains a custom CharacterController class, which is not covered into its own namespace, therefore there are conflicts with the original CharacterController class of Unity, which ICE want to use for the player. Please looking for a custom "CharacterController" class within your project and remove this class or define a namespace for this class. Please note that 'CharacterController' is a standard Unity class and you'll get problems whenever you are using such reserved names for custom classes without using a valid namespace. I hope this will be helpful to you! He also recommend removing the complete ICE folder before you import the new version of ICE to fix namespace errors.